Charbax is back again with another video showing off E Ink’s latest prototypes from the recent SID Display Week convention in Los Angeles. This time around E Ink is showing off an ereader with a foldable 10.2-inch screen. The flexible display allows the device to be folded in a book-like manner, making a large ereader more portable. The plastic-based screens have 220 ppi and are based on E Ink Mobius technology. E Ink says they’re ready to start mass producing the foldable screens once some buyers emerge. The video goes on to show a number other E Ink products, along with a 10.7-inch flexible display from Plastic Logic for some reason, a product that’s been in development for like 20 years now but never seems to make it onto the market. They also show off an E Ink dress, a 42-inch sign, smart cards and smart watches, but the foldable screen is by far the most interesting new development. New $49 Fire Tablet vs Old Fire Tablet – Is it Worth Upgrading? Totally futuristic! This is the way Eink will be integrated into our lives. I like the enthusiasm of the pretty lady for her company! And wow, an ebook that opens! It ended up being better than I thought when I first saw the title of the video. If they get the design details right something like that could actually be pretty cool. This device is certainly impressive, but is hardly pocket-able with such a large fold radius.However I would certainly buy one, unless price is excessive. I think the main reason Sony got out of the market when they did was due to the fragility of the glass substrate. 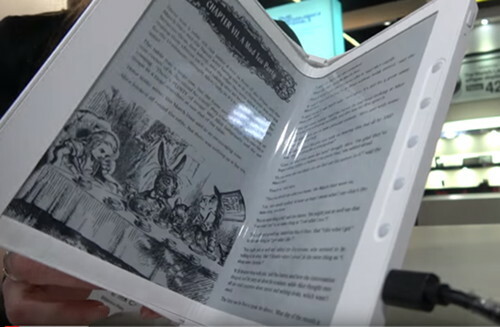 Flexible plastic screens are long overdue for mainstream Ereader devices. As I am sure anyone who has inadvertently broken a glass based screen will welcome. Will ne nice to see where this technology goes. Long term – cost is going to be key.